Born in Bradford, on December 3, 1929, he was the son of Axel J. and Jennie Elvina (Taylor) Johnson. After AJ's father died during an oil field accident in 1941, he grew up quickly. He stopped his formal schooling and supported his mother through a variety of jobs. Those skills he learned the hard way served him well in later years. Axel was determined to earn a formal diploma and successfully earned his GED in 1968. On June 10, 1950, he married Esther (Raught) Johnson who survives. AJ & EJ started dating in 1945. They loved square dancing, especially wherever Cowgirl Clara was performing. In 1955 they moved into their home in Irishtown and enjoyed 68 devoted years together. 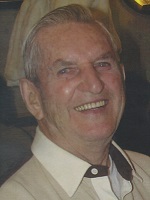 Axel worked 23 years at Hanley Brick Co. in Lewis Run and later at Kendall Refining Co. for 25 years, retiring in 1995. He was a proud member of the Kendall Quarter Century Club. AJ was a 50 year member and Past Master of the Kane Masonic Lodge #566, R.W. Grand Lodge F&AM of Pennsylvania, a member of the Coudersport Consistory, McKean County Shrine Club, Orak Grotto, and Zem Zem Temple, the Odd Fellows Lodge of Mt. Jewett, and the International Association of Turtles. He had also served as Lafayette Township supervisor. He enjoyed bowling, his back hoe, Stroh's, spending time with his family and many friends and "putterin". Axel was tenaciously hard working, fair-minded, loyal and good-humored. He will be missed. In addition to his wife, Esther of 68 years he is survived by a loving daughter, Cheryl (Rick) Lutz of Bradford. Family will be receiving friends on Thursday, December 6, 2011, from 11:00am to 1:00pm in the Hollenbeck-Cahill Funeral Homes, Inc., 372 East Main Street, where funeral and committal services will be held 1:00pm with Rev. Jay Tennies, pastor of the Hill Memorial United Methodist Church, officiating. Burial will be in McKean Memorial Park. Members of Kane Lodge #566 F&AM will conduct a Masonic Service Thursday at 12:30pm in the funeral home. In lieu of flowers, memorials may be offered to the Lafayette Volunteer Fire Department 7004 Rt. 59, Lewis Run, PA, 16738 or Shriners Hospitals for Children-Erie, 1645 West 8th St., Erie, PA 16505 or the charity of the donor's choice. So sorry to learn of Axel''s passing. We had such a good time bowling for many years together. I will always cherish the good times we had on trips both by auto or in the RV. May he rest in peace! So very sorry for your loss. Axel was a great person and so dedicated. This is a wonderful tribute to his determination. He gave so much and you had his love. He had your love as well. Thinking about all of you at this very difficult time. Prayers coming your way. So sorry for your loss - our prayers to Cheryl & Rick and Aunt Esther. May God Bless and Comfort all of you during this time of loss. I am honored and humbled to have known Axel. He will be well received in God''s Kingdom! What a nice man Axel was. I remember him delivering oil to me. He worked hard and yet always was pleasant, friendly and still made time for a little small talk. Axel will surely be missed. So sorry for your lose. Our thoughts and prayers are with you and your family. My sympathies to Esther and Cheryl. Axel was a kind great gentleman. I loved the obit.